Race Review: Standard Chartered Marathon Singapore 2015 [HM] (by Kelsey and Kang Jing) | JustRunLah! Standard Chartered Marathon Singapore (SCMS) has always been the marquee running event in Singapore, and being held in the first week of December, the event has been regarded by many runners as a grand finale to the year. 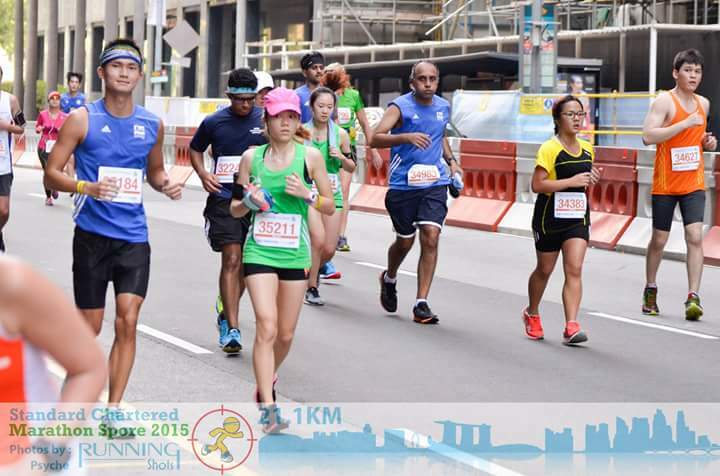 This year, it was held on the 6 December 2015, with registration opening as early as July. Similar to last year, Kelsey and I decided to resister for the half marathon. Flag off time was 6.30am at sentosa gateway. We arrived at Vivocity with 45 minutes to spare and it was already so crowded! 😮 Even so, bag deposit was smooth and quick, queuing time at the portaloos was faster than we expected. 15 minutes before flag off, we were already at the start pen with many other runners, sadly stuck in the second wave. The sun was already rising by then and we predicted that we were in for a long hot run. Kelsey and I had agreed to go out and enjoy today’s race, putting timing aside. We took off at a comfortable pace, soaking in the amazing atmosphere with thousands of runners along us. Some wonder why do we pay to join running events when we could run for free. It’s because of the experience and atmosphere, the feeling of so many like minded enthusiastic people running together. It’s a stark difference from running alone. With countless slopes and numerous turns early in the route, there were quite a number of walkers early in this stage already. We were still handling things fairly well because of the pace we were doing. We finally entered the highly anticipated USS at the 5th km and ran one loop inside before exiting Sentosa. That was the highlight of the whole route because USS is just so beautiful. Running pass castles, seeing cartoon mascots around such as Elmo and Madagascar, it felt like a fairy tale run. 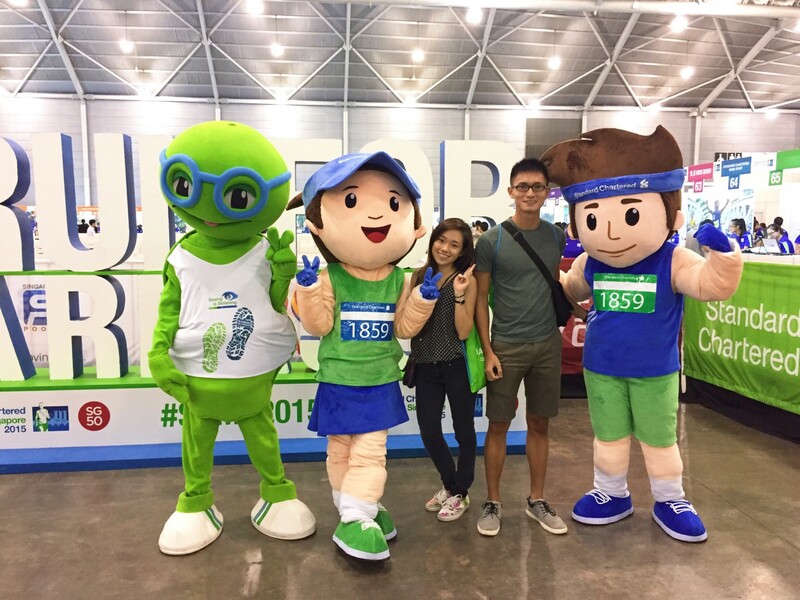 Many runners were stopping to take photos with the mascots, but we didn’t want to disrupt our momentum so early in the race. After completing the loop in USS, we exited Sentosa through the stuffy and dark carpark onto the main island. The 10th km to the 18th km was spent on West Coast Highway AKA the highway of HELL! I guess fairytales don’t always end with a happily ever after. We had already mentally prepared ourselves for the highway because the route was similar to last year. We filled our bottles to the fullest at the water station before entering the highway as we get ready to take it on. It was a 2 way traffic for 3 quarters of the highway so we were anticipating a u-turn point up ahead. Medics were stationed every few hundred meters with muscle cream for the runners and there was only 1 water station around the 12km mark. The sun was already out in full force as we finally crossed the U-turn point. This made it even harder for us to run because the gravel on the road was radiating the heat and the sun was shining directly at our faces! The heat was extremely intense and even though the next water point was only 4km away, we had already emptied our running bottles long before we reached there. Highway of hell was indeed living up to its name. We eventually crashed out and gave in to the heat at the 16km point. Even with our water belt and hand held bottle, we were still feeling dehydrated. We were just thinking about those without a bottle and how much worse they were feeling. There had been several ambulances that went pass us with some heat exhaustion casualties and we decided that it wasn’t worth risking it. We slowed down to a walk as we dragged ourselves on for the rest of the highway. To be honest, I felt pretty disappointed that we had to walk in a race because we never had to before. Boy was I glad when we finally exited it and entered the city area. The highway had us all exposed openly to the scorching sun so running pass the high rise buildings alongside Robinson Road was a great change. It was way more cooling and with the shelter from the buildings, so we decided to push ourselves a little and finish the race strongly. This was Kelsey’s favourite part of the race. We managed to complete our 4th Half Marathon together in a timing of 2 hours 39 minutes, certainly not the best, but it was decent enough for us. 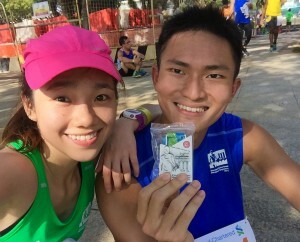 We surely enjoyed each other’s companion throughout the entire race. We were encouraging each other at times when we were reluctant to start running again. It had made the tough journey much more bearable. 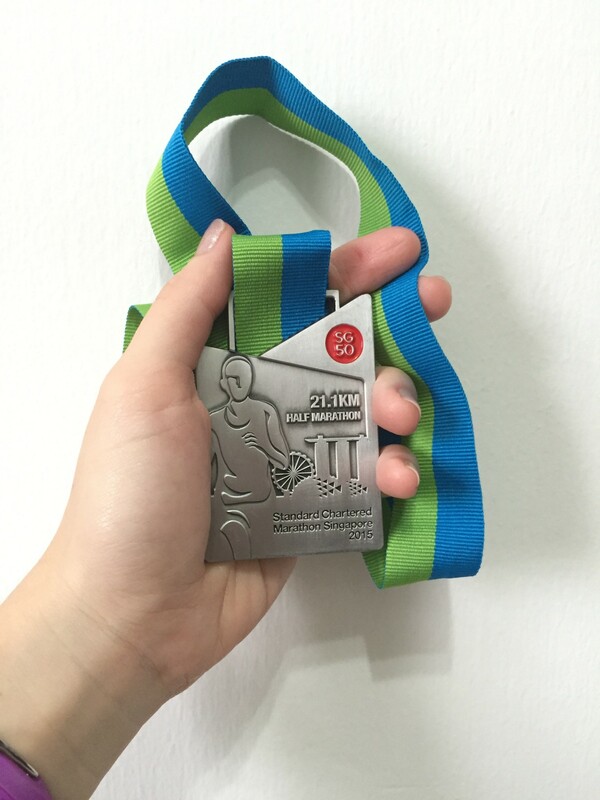 This was probably the toughest HM that we had done together so far, and we are proud to have survived it! We are so happy we finished the race ! Well done! 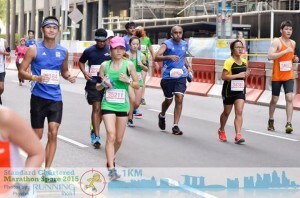 Though all runners get punished by the heat but everyone beat the heat by crossing the finishing line….cheers!